I skipped last week's P52 assignment. I couldn't find time to photograph anything that went with what I thought of for hunger. And I certainly wasn't thinking in terms of The Hunger Games- sorry that's one bandwagon I'm not on. I'm late posting my shot for this week's theme - details. 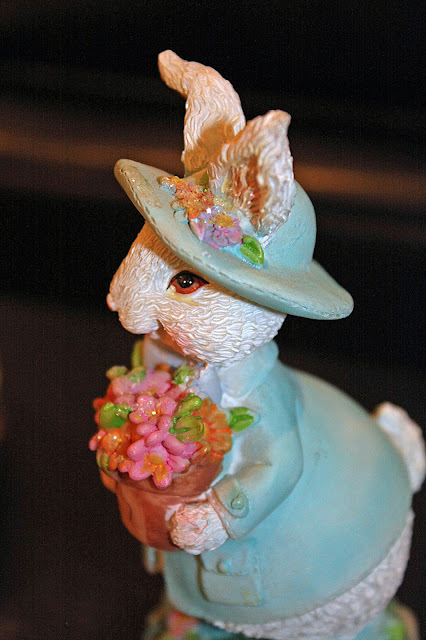 I was thinking of close ups, so I took a close up shot of one of my Easter bunnies so you could see the detail of her bonnet and flowers and the detail that makes her look "furry". I'm not happy with the shadows, but sometimes, you get what you get. What a sweet little bunny. She does look furry.